The association for Train Touristique du Centre Var (ATTCV) in Carnoules has recently received a new rail vehicle, a model DU 65 track inspection railcar. 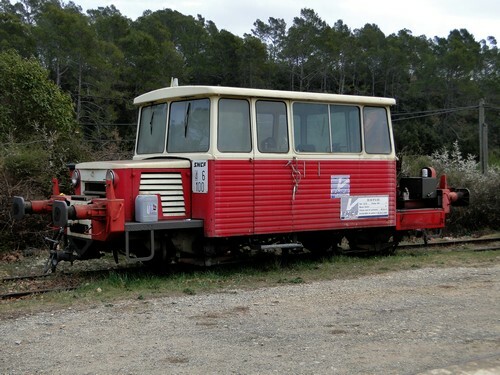 This motorized vehicle (in France called draisine) was manufactured in 1965 and has been used by the state railways (SNCF) for infrastructure works and track maintenance. It was based in Aubagne east of Marseille before its arrival in Besse. It has a length of 8.3 meters and can seat approximately 15 persons, inluding the driver (who is seated in the middle of the cabin and changes his view of the line simply by turning his head to the left or to the right (cf. the driver's position in the railcar Picasso)). After revision it is intended for use for track inspection and to move track work crews.